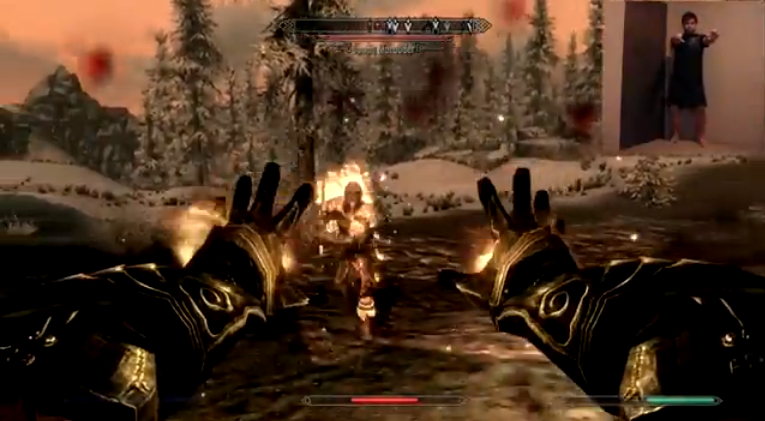 You'll need to watch the video to get a real sense of what's involved here but I'll let you know in advance, it's a very cool and extremely effective way of playing Skyrim. All the basics are covered from using your sword by swinging your arms to casting spells by raising them. You walk by placing your foot slightly forward and run by moving it closer to the Kinect. Lean to change directions (back, left, right). A ton of other simple commands have been assigned to keybindings so you can perform a plethora of commands by simply gesturing as you would in real life! Now for the icing on the cake. If you're familiar with the game at all, you'll know that a new tactical feature called "Shouts" which have been added to the game. What better way to perform a Shout command then to actually shout something! This is where VAC (Voice Activated Commands) comes in handy. Watch the video to see how quickly he's able to switch from dual casting, to long bow, to shield to healing and then back to a long sword. The game play never skips a beat as the user is able to quickly and efficiently switch between hotkey assigned items by simply issuing a voice command. A detailed explanation accompanies the video on the YouTube post located here. Brilliant and awesome work. Makes me wish I picked this up for PC instead of the PS3!